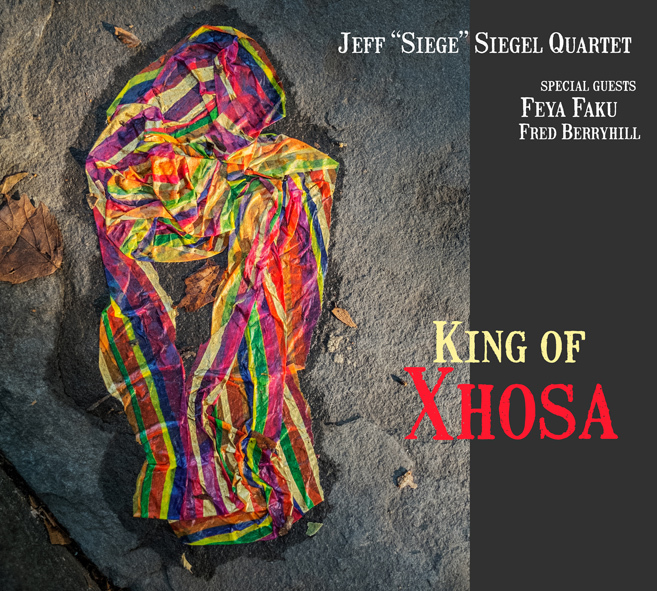 Artist Recording Collective (ARC) is proud to announce the release of "King of Xhosa" by renowned drummer and composer Jeff "Siege" Siegel. On the Jeff Siegel Quartet's third studio recording, the stalwart drummer merges his high energy, straight ahead post-bop with the deeply spiritual stylings of trumpet master Feya Faku to produce a vibrant sonic tapestry of South African infused jazz. "King of Xhosa" brings together Siegel's longstanding quartet comprised of saxophonist Erica Lindsay, pianist Francesca Tanksley, and bassist Rich Syracuse with percussionist Fred Berryhill and trumpeter extraordinaire Feya Faku. Jeff Siegel and Feya Faku first came together in 2014 in Siegel's home-turf of Woodstock, New York when Faku visited there to perform with Uhadi, his group of select South African musicians. Siegel was immediately drawn to Faku''s sound. "From the first time I heard Feya in Woodstock, I knew that he had the perfect vibe, sound and soul to fit with my own quartet," says Siegel. That summer, Siegel embarked on the trip of a lifetime to Cape Town and Grahamstown, South Africa, where he participated in the International Association of Schools of Jazz, and performed at the Grahamstown Jazz Festival. It was during this profound trip that the idea of a collaboration with Faku truly took hold. "Because African music is the roots of what we play as Jazz musicians, there was a feeling of being home while I was there," he says, "...it was a blessing to meet, hear and play with wonderful musicians and experience the soul of Africa firsthand. The title "King of Xhosa" is an homage to the South African musician as well as his people. "Feya's lineage is of the tribe known as Xhosa - the 2nd largest ethnic group in South Africa after the Zulus. They are known as "prophets" and have had several kings," explains Siegel, adding that although Feya himself is not a "king" per se, he nonetheless "carries and conducts himself in a most regal manner." Homage is a recurring theme on "King of Xhosa" with each of the nine tracks having been composed with specific inspirations in mind. On 'Totem,' the album's opening 'call to worship' inspired by Xhosa dancers, Faku's resonate vocals soar. On 'Prayer', composer Tanksley pays tribute to the "power of merciful love", while Faku composed 'Courage' with his teachers in mind. Siegel's poignant 'Ballad of the Innocent' is dedicated to the victims of the Brussells bombing while Tanksley's 'Life on the Rock' is dedicated to each of the musicians on "King of Xhosa". All in all, "King of Xhosa" is a celebration of the intersection of cultures. "I hope this music in some way reflects the deep respect I have for the great cultures of both Africa and the United States. While we are profoundly aware of the great pain that resulted in the birth of Jazz music, born from the tragedy of slavery, we are forever blessed with the positive outcome of the joining of these cultures in music. I pray that this recording shall add some positivity, inspiration and strength to a troubled world in whatever small way it can," says Siegel. 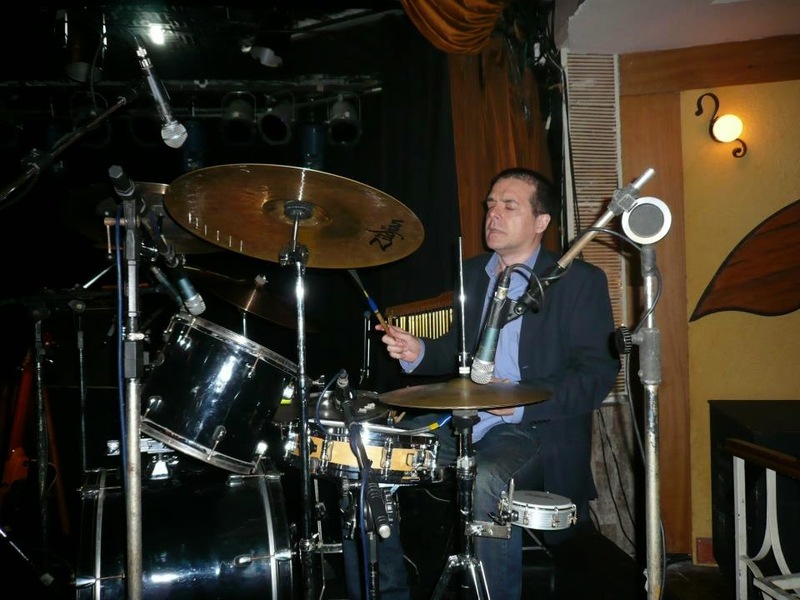 Drummer/Composer Jeff "Siege" Siegel is a veteran of the New York Jazz scene and has worked with a virtual "who's who" of artists. He came onto the New York scene in 1980-83 as a member of the quartet of the legendary multi-instrumentalist Arthur Rhames. After six years with the group Second Sight, which featured trumpeter Dave Douglas, Siegel became a member of the Sir Roland Hanna Trio from 1994-'99. From the years 1990 - present he has been co-led several touring ensembles as well as The Jeff "Siege" Siegel Quartet. Simultaneously, from 2001 - 2015 Siegel was also a member of the Lee Shaw Trio from whom he also produced several cds and a dvd. Siegel's diverse career has also led him to perform and/or record with legends such as Ron Carter, Kenny Burrell, Jack DeJohnette, Pat Metheny, Benny Golson, Frank Foster, Sheila Jordan, Helen Merrill, Mose Allison, John Medeski, Stefon Harris, Kurt Elling, Ravi Coltrane, Ryan Kisor, Steve Wilson, John Medeski, Dena DeRose, Dave Liebman, Pete & Tony Levin, Steve Turre, and many others. He has worked in the avant-garde world as well with artists such as Wadada Leo Smith, Baikida Carroll and Esa Pietila. He has performed over 30 European tours including four as leader of the Jeff "Siege" Siegel Quartet and several others as co-leader at various festivals, concert venues and clubs. His touring has also led to performances and clinics throughout the United States, South Africa, South America, China and Canada. As an educator, Siegel is a faculty member at The New School for Jazz and Contemporary Music, Western Connecticut State University, and The State University of New York at New Paltz .He holds a Masters Degree in Jazz from Queens College where he studied composition with Jimmy Heath. He has been the recipient of several grants from Meet the Composer and endorses Vic Firth Drum sticks. Please be on the lookout for two upcoming new cd releases with his quartet including "London Live" (ARC Records) and "King of Xhosa" featuring South African trumpeter Feya Faku. As recently as October 2012, Faku was Artist in Residence at the opening of the International Jazz School of the University of South Africa. 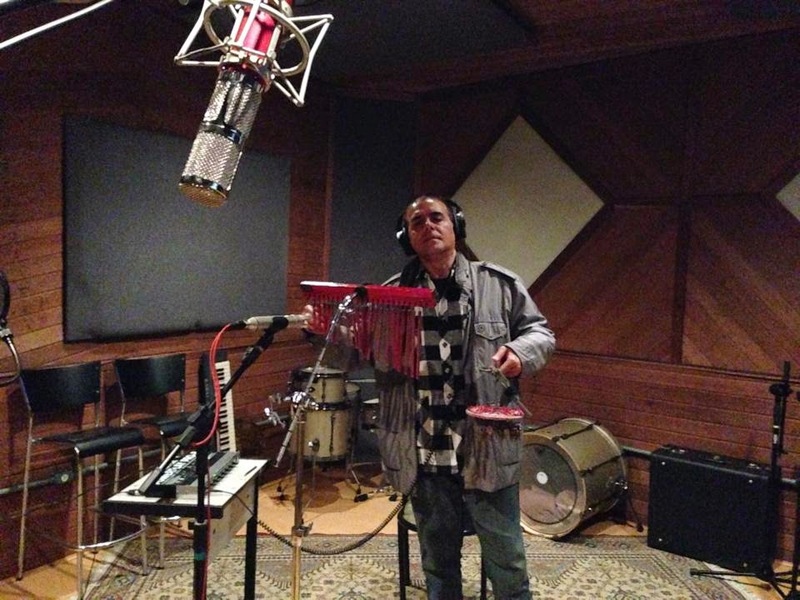 Over the past two years Fezile has recorded several cds as a sideman and toured the U.S. extensively with the South African group known as "Uhadi" as well as with Kesivan Naidoo & The Lights. Confira o depoimento de Arnaldo DeSouteiro ao portal Coisas da Música, agora na íntegra, em sete partes. No capítulo 1, o jornalista e produtor fonográfico fala das primeiras influências musicais. Tudo começou em casa, a partir de uma família extremamente musical: os pais Delza Agricola (pianista clássica e regente, primeira Maestrina formada pelo Conversatório Brasileiro de Música) e Walter Souteiro (pianista amador), a tia Elge Agricola (também pianista clássica, formada pela Escola Nacional de Música), a tia-avó Aurette Palermo (que também muito contribuiu para a sua coleção de discos iniciada ainda na infância), e os avós Ernani Agricola (renomado médico que tocava violoncelo, flauta e piano) e Aurea Agricola. Entrevista realizada por Bernardo Costa em 11/07/2016. Singer-songwriter Hiromi Suda will be releasing her third album, "Nagi," on the Blujazz label, on March 7, 2017! She will be appearing in New York City at Subrosa on March 9 to celebrate the release. The radio add date is February 21. 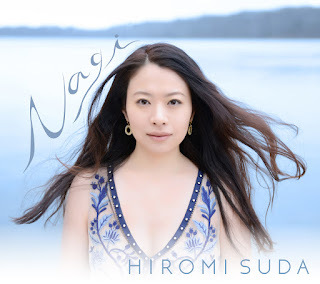 "Nagi" is the latest and most fully realized iteration of Suda's singular hybrid conception, by which she mingles and juxtaposes the musical cultures of Japan and Brazil. The album was first released in Japan this past July on Inpartmaint Inc. to critical acclaim. As of March 7th, "Nagi" will be available worldwide on HDTracks and on iTunes. 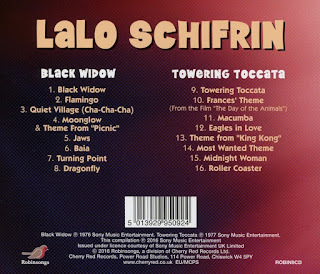 CD Reissue of the Month - "Lalo Schifrin: Black Widow & Towering Toccata"
These albums feature some of the greatest jazz musicians of the period including Eric Gale, John Tropea, Steve Gadd, Hubert Laws, Don Alias, Sue Evans, Anthony Jackson & Joe Farrell to name but a few. 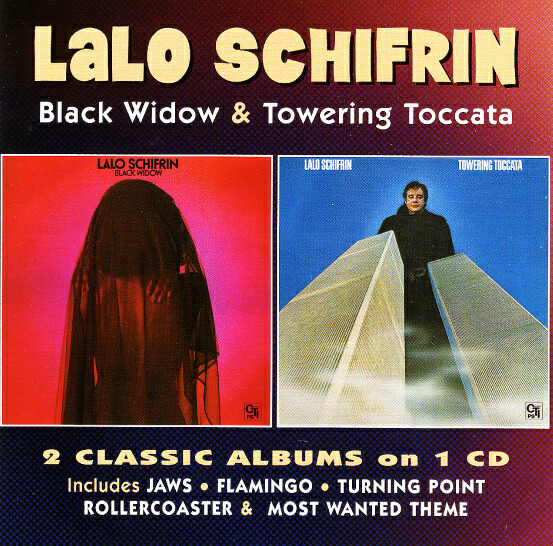 Lalo Schifrin puts a jazz-funk vibe to some classic movie themes including Steven Spielberg's blockbuster "Jaws" which was released as a single and charted at 14 in the UK Singles chart, and became a worldwide Disco smash. Schifrin's CTI debut "Black Widow" proved a hit as it landed at no. 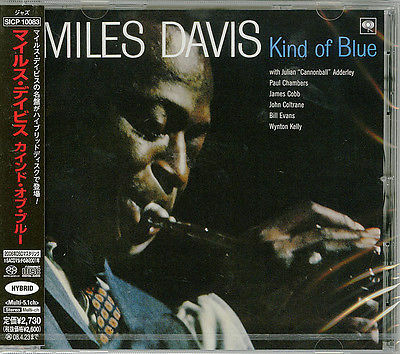 22 in the US list of Jazz bestsellers, and it also appeared on the R&B chart. 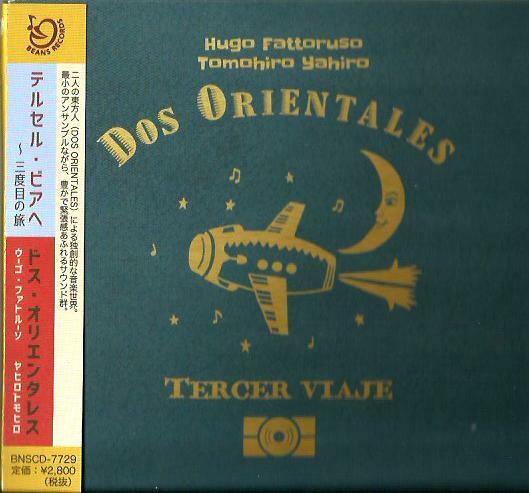 There are stunning arrangements of "old" material: Ary Barroso's "Bahia" (Na Baixa do Sapateiro), Les Baxter's "Quiet Village", the lovely "Flamingo," and the standard "Moonglow" (Theme from "Picnic.") It's a joy to listen guitarists Eric Gale and John Tropea playing together in all tracks! 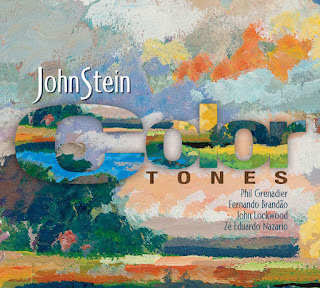 Buoyed by good sales and the encouraging public reception Schifrin returned to the studio to cut his second CTI album "Towering Toccata," featuring Jeremy Steig, Urbie Green, John Blair, Clark Spangler, Don Armando, Steve Gadd, Will Lee, John Tropea, Ralph MacDonald, Ronnie Cuber etc. Again there was plenty of effervescent disco-funk grooves (even on the title track, an adaptation of the famous "Toccata & Fugue in D Minor" by J.S. Bach!) plus big movie themes including "King Kong." But also some ballads like "Eagles In Love" and "France's Theme." My personal favorite track is "Midnight Woman," a song I've included in my compilation "CTI Acid Jazz Grooves" back in 1997, featuring Lalo's terrific solo on Fender Rhodes. This reissue features liner notes by Charles Waring, contributor to MOJO magazine & Record Collector. 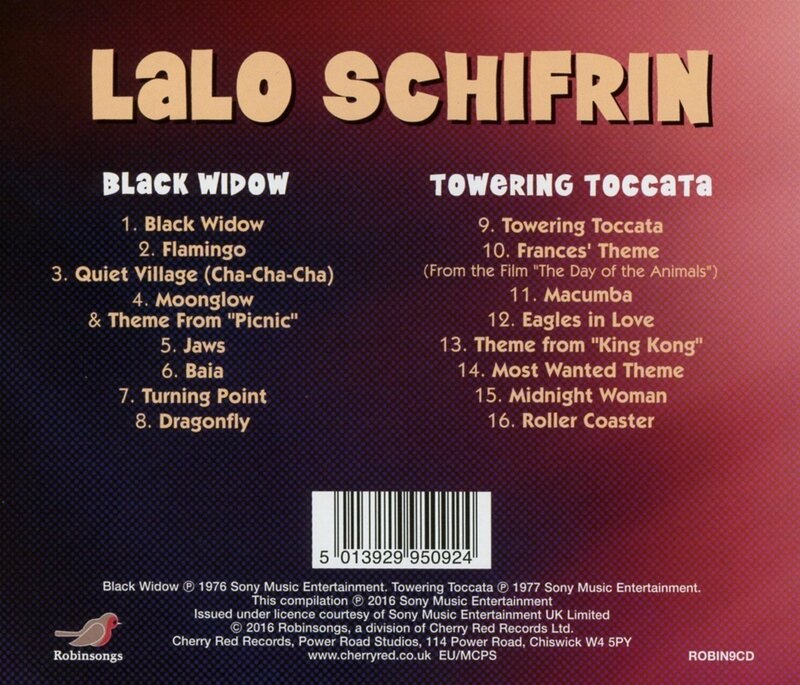 A pair of CTI 70s classics from Lalo Schifrin – back to back on a single CD! First up is Black Widow – funky 70s work from Lalo – with a bit of a disco twist, and plenty of the electric jazz funk elements that were showing up in his soundtracks at the time! Lalo's on keyboards, playing a cool host of electric ones that give the record a nice spacey sound over the top of the funky arrangements. There's plenty of nice guitar work – either by Eric Gale or John Tropea – which gives the cuts some nice choppy funky bits that drive them a bit harder than you might expect. Includes an amazing funk remake of "Quiet Village", plus "Dragonfly", "Black Widow", "Baia", "Turning Point", and a version of the "Jaws" theme! Towering Toccatta is electric 70s work from Lalo Schifrin – with a tight uptempo funky sound that's similar to his strong "cop show" soundtrack themes of the time! This album's a pretty great testament to Lalo's durability as one of the great composer arrangers – sublime stuff from the late 70s, and a record that really works nicely alongside Schifrin's music for films. Lalo's got a great crew for the set, too – including Joe Farrell and Jeremy Steig on flute, Eric Gale on guitar, Anthony Jackson on bass, Steve Gadd and Andrew Smith on drums, accompaniment on keys by Chuck Spangler and a host of others! Titles include "Eagles In Love", "Macumba", "Theme From Most Wanted", "Theme From King Kong", and "Roller Coaster". 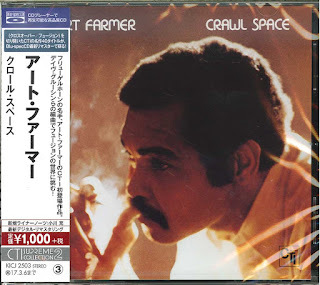 Blu-spec CD of the Month - "Art Farmer: Crawl Space"
One of Farmer's best sessions for CTI. I only don't give it 5 stars because of Grusin's boring title track. But the other tunes are top class. 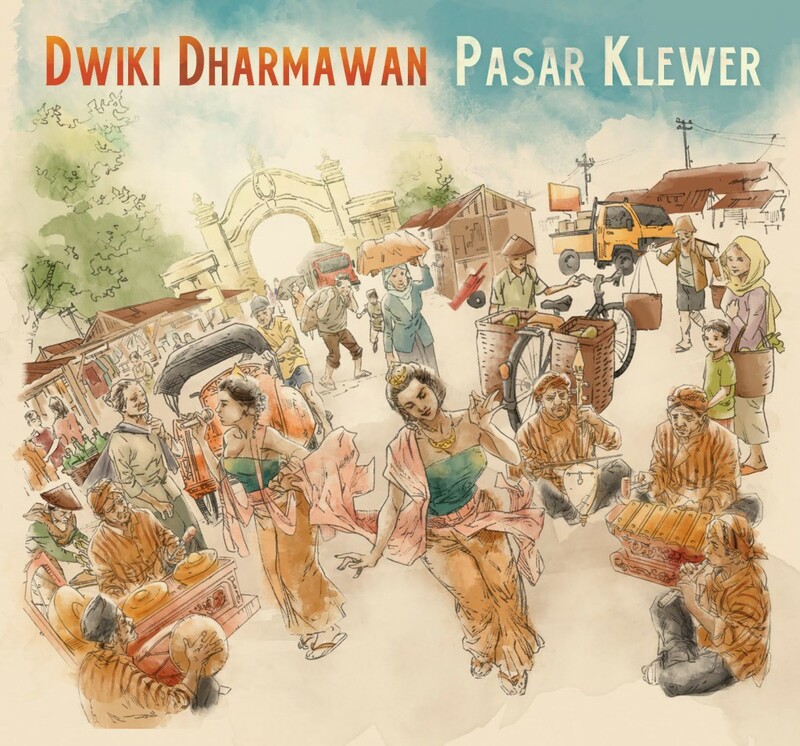 There's a beautiful ballad by Austrian pianist Fritz Pauer ("Siddharta") and two lovely medium-tempo songs on which Dave Grusin performs delightful solos on Fender Rhodes: Farmer's "Petite Belle" and Grusin's own "Chanson." 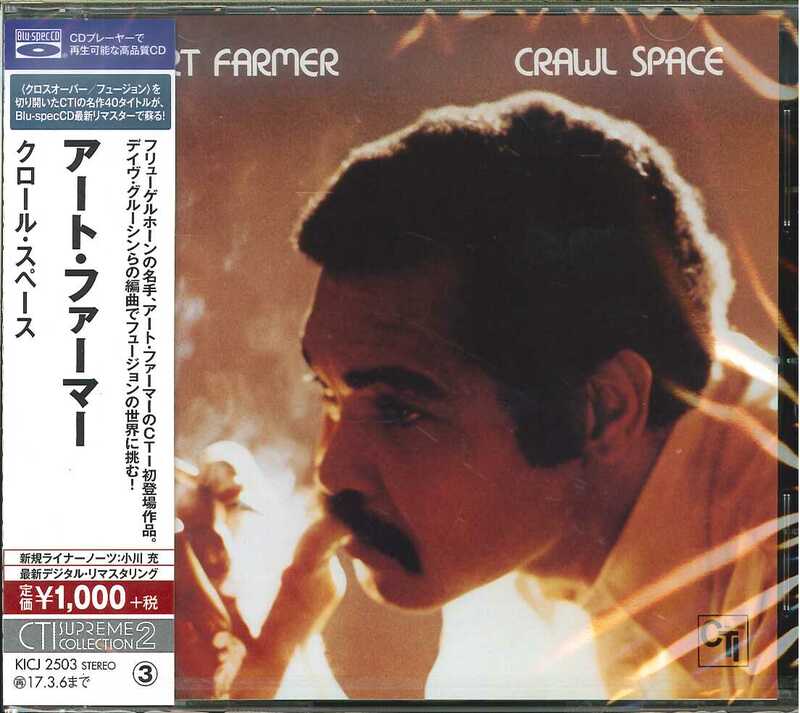 Farmer sounds impeccable throughout the album, soloing with perfect articulation over a tight rhythm section. 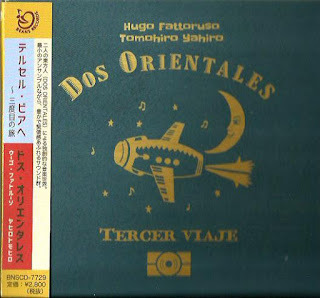 Beyond CD of the Month - "Hugo Fattoruso & Tomohiro Yahiro: Dos Orientales / Tercer Viaje"
Pop CD of the Month - "Vitoria Maldonado: Vitoria"
Vocal Jazz CD of the Month - "The Baylor Project: The Journey"
Steeped in the heart and soul of jazz, Marcus and Jean Baylor's highly anticipated collaboration showcases the grace and glory, versatility and virtuosity of a truly extraordinary musical union. Joining Marcus and Jean on their self-produced debut is an expansive assemblage of top-notch collaborators including pianists Allyn Johnson and Shedrick Mitchell, guitarists Rayfield "Ray Ray" Holloman and Marvin Sewell, bassists Dezron Douglas, Chris Smith, David "DJ" Ginyard and Corcoran Holt, percussionists Pablo Batista and Aaron Draper, tenor saxophonists Keith Loftis and Bob Mintzer, trumpeters Freddie Hendrix and Keyon Harrold, trombonist Stafford Hunter and harpist Brandee Younger. As the children of Pastors, Marcus and Jean's musical roots were planted deep within the church, and it was there that the road was paved for the influence of gospel, blues, soul, and jazz to make it's mark. On "The Journey", listeners are taken on a comprehensive musical journey that showcases as much versatility as it does virtuosity. A world-class drummer, Marcus' creativity and innovative storytelling ability expose his seasoned improvisation and musicianship. Jean, with her agile mezzo-soprano range, combines a fresh, whimsical, approach to phrasing with clever musicality resulting in soul-hugging vocal purity. Their first feature recording together embodies the true spirit of love while also paying homage to their musical roots and those of the African American experience. "The Journey is a true reflection of our childhood, the musical and cultural influence of the African American Church, and all the things that have become a part of our creative fabric from then until now," says Jean. As co-creators of their label Be A Light, Marcus and Jean served as the sole producers of "The Journey". "As producers, we were involved in every aspect of the project from inception to completion," says Marcus, adding, "...from songwriting, arranging and collaborating with great musicians to cultivate the sound we heard in our heads, we loved having the autonomy to create music from the inside out." Anchored by their exceptional band, The Baylor Project made their live debut in 2013 at Smoke Jazz Club to critical acclaim. Such a success, they were extended an invitation to remain in residency at Smoke for the coming year. "Performing on a regular basis not only gave us the opportunity to evolve as a band, but to build a buzz and anticipation for The Baylor Project," says Marcus. The buzz was certainly built; word-of-mouth brought packed houses at the famed Blue Note, Apollo Music Café, and DC's Blues Alley, leading to performances in premiere jazz festivals across the United States and Europe--a glamorous arrival for two people from humble beginnings. Marcus is a native of Ferguson, MO and Jean, a native of Moorestown, New Jersey. Both grew up in a tradition that imprinted itself upon their craft. It is apropo that it was their craft that brought them together back in 2000. It was then that Jean was set to perform at a showcase and found herself in need of a new drummer. On a fellow musician's referral, Marcus and Jean were connected for the first time through music. As a close friend tells the story, Marcus fell in love with her that night on stage. With "The Journey," the Baylor Project showcases their outstanding versatility with a dynamic collection of original compositions, newly arranged standards and reimagined hymns. Upon pressing play, listeners are transported into the heart of the black experience: inside a little church in the mountains of West Virginia built by Jean's ancestors, hands are clapping, feet are stomping on time tested hardwood floors, and voices testify to the power of prayer in song. "Block Party" is the joyful introduction to the Baylor Project rife with the church blues and jazz improvisation. What follows is the Baylor's signature arrangement of the stalwart hymn "Great Is Thy Faithfulness" and their lush arrangement of the Herbie Hancock classic "Tell Me A Story", which is enhanced by original lyrics penned by Jean. A restorative hymn for healing and forgiveness begins the original composition "Again" which then gives way to a full swing orchestration with horns and strings featuring explosive solos. On the following track, the Baylors present a beautifully moody arrangement of the Gershwin classic "Summertime" with the lush stylings of harpist Brandee Younger, thus providing a remarkable remedy for the familiar. On "Afro Blue", listeners are filled with an open palette of sound that brings forth a sincere spiritual offering of faith, strength and resolve. Afro Blue is a journey in and of itself through the collage of solos that express a deep connection to their cultural roots. An interesting surprise, penultimate tune "Laugh and Move On" is a tribute to a simpler time in music. "This song reminds me of an era in music that focused on telling a story with a lot of soul and some good ole' fashioned singing about letting the tough times roll off your back," says Jean. Likened to an aria, Jean's beautiful and sometimes haunting vocal arrangement is sung over Marcus' dramatic drum solo on the final track "Journey". Vacillating in and out of tempo and bound only to the rhythm of the soul, the two dance together telling their stories. 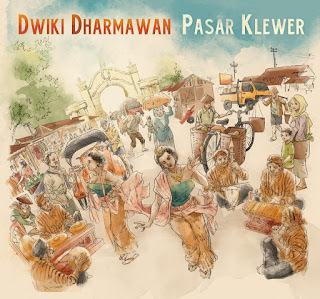 Intertwined with voices of their personal lineage that give audible accounts of the discovery of their musical gifts, it is the perfect ending to the story and cleverly circles listeners right back to the beginning. "We want to inspire, foster hope and ultimately, bridge the gap between generations in our culture," says Marcus. 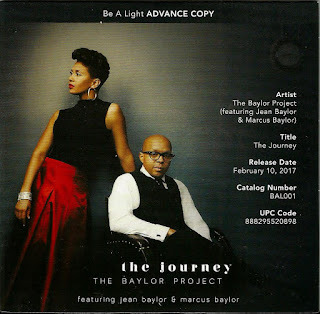 With "The Journey'', The Baylor project does just that. They are relatable, they are virtuosic, and for these reasons they captivate listeners and packed houses alike. "The Journey" pays homage to their wide-ranging musical influences, and in so doing; they generate an eclectic sound whose overall effect is spiritual, buoyant, and feel good music. Fresh off the heels of their sold-out CD release mini tour throughout NYC, Philly and Washington, DC, The Baylor Project will be appearing in Boston, MA at Scullers Jazz Club on March 31; in Alpharetta, GA at the Velvet Note on April 28; at the Art of the Cool Festival in Durham, NC on April 29 and at The Art Garage in Delray Beach, FL on April 30. "The Baylor Project" is an innovative collaboration merging the talents and creativity of this dynamic husband and wife duo, Marcus and Jean Baylor. Both artists have established themselves in the music community, Marcus as a jazz musician having toured and recorded with Kenny Garrett, John Scofield, Cassandra Wilson, Joshua Redman, Christian McBride and as a long-time member of the Grammy Award Winning, Yellowjackets. Jean first established herself in R&B as a platinum selling recording artist and later emerged in jazz having recorded and toured with Kenny Garrett, Marcus Miller, Yellowjackets, Jimmy Greene and legends, Harold Mabern and Buster Williams. The Baylor Project was founded in 2013. Instrumental Jazz CD of the Month - "John Stein: Color Tones"
Package Design: David Arruda Jr.